Detaching Shakespeare from historical references is the business of the doubter on the Clapham Omnibus and misinterpreting the Shakespeare family's application for armigerous status has been a long term favourite. Here the doubter tactic involved pretending that two very different things were actually the same. In this case the coat of arms described as belonging to a character in a play by Jonson named Sogliardo. The claim is based on the idea that the coat of arms Sogliardo describes as his own is similar to that submitted by Shakespeare to the College of Heralds. Ros lays out this claim as the foundation for further, more adventurous claims all helpful to her premise. Sadly an expert in heraldry was on hand to recreate the arms described in the play. Which look nothing at all like those in Shakespeare's name in the College of Heralds. Ros' initial reaction was a full blown sneer at people ‘who have too much time on their hands’. A bit off-putting in a course tutor who had clearly had enough time to tinker with Photoshop to her own satisfaction. She came to her senses, deleted that comment and substituted a generous acknowledgement. A fortnight later. After the argument was well and truly lost. And some of the posts pointing out her inconsistency had vanished with the original. A submission, nonetheless. One down, how many to go? It occasioned the most enlightening discussion in the whole course as a participant then suggested that Shakespeare's arms resembled those of the Earl of Derby and perhaps constituted evidence for another aristocrat as author. It was a moment for a list of genuine historical evidence for Shakespeare's authorship. Evidence that had't been conjured out of thin air. Mark Johnson posted a list. In fact, there is direct, documentary evidence that explicitly and uniquely identifies William Shakespeare of Stratford, by his name and the specifically applicable signifier of his social status, as the author of certain of the works. (5.) 1610 (From The Scourge of Folly by John Davies of Hereford; registered October 8): "Mr. Will: Shake-speare"
(6.) 1612 (From "Epistle" to The White Devil by John Webster): "M. Shake-speare"
(9.) 1616 (Q6 Lucrece): "Mr. William Shakespeare" (title page). (14.) 1623 (Stationer's Register entry for First Folio; November 8): "Mr. William Shakspeer". There is no need for implied meanings here. Rather, these documents are explicit on their face. They are direct evidence for the proposition that Master William Shakespeare of Stratford, Gentleman, was the author of the works named within the documents themselves. Someone may wish to argue that these documents are the product of a conspiracy to put forward a front man to hide the true author’s identity [and I’d enjoy seeing some actual evidence for that proposition], but I am unable to discern any logic that would support a claim that the documents do not qualify as direct evidence that links the authorship directly to William Shakespeare of Stratford. Here are some of the other references to WS of Stratford as “Mr.” Shakespeare, gent. (1.) 1601 (Deed transfering the Globe and other Southwark properties from Nicholas Brend to Sir Matthew Brown and John Collett as security for a 2500-pound debt; October 7): "Richard Burbadge and William Shackspeare gent." (2.) 1601 (Updated deed for the above transaction; October 10): "Richard Burbage and William Shakspeare gentlemen" (3.) 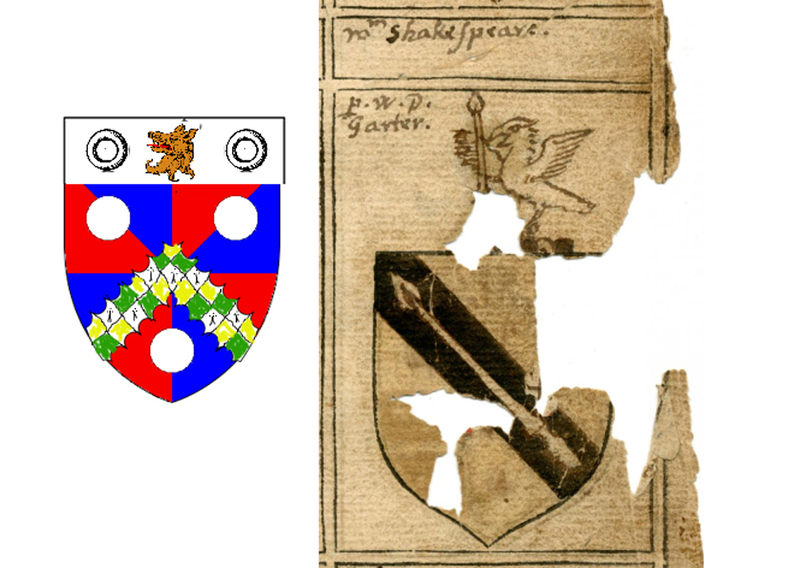 1608 (Deed transferring the Globe and other properties from John Collett to John Bodley; November 11): "Richard Burbadge & William Shakespeare gent"
Nat, I'd like to include this mocked-up Sogliardo coat of arms in the course material. Would you...give your written permission to do so? I think it's a valuable contribution to the coat of arms discussion (and visually, very strikingly, supports disagreement with the Sogliardo=Shakespeare idea).